Thanks to NetGalley and Random House UK, Cornerstone for the ARC of this book. I love Harlan Coben books and always look forward to a new one. They are always a quick entertaining read with thought-provoking family quandaries. This one is one of Coben’s stand alone books, although it does feature a couple of recurring characters from his other books just as a wink to his regular readers. It was, as expected, an easy, enjoyable read, but I didn’t find it one of the best examples of his work. I was more than half way through the book when I realised I was still waiting for that intriguing hook that most of his books have to make you interested. I think I have probably just read too many of Coben’s books now, so the themes are very familiar and they are not as surprising or fresh as they were when I started reading his books. I still enjoy his voice and find the books a good read but they just lack the fizz and surprise elements they used to have for me and are beginning to feel quite formulaic. I think the unique hook for this book was supposed to be figuring out the connection between the murder of several men who have all recently used a DNA service, but this never quite sparked my interest as a mystery. There’s also the question of what has happened to the lead character’s junkie daughter, but I didn’t care much for this mystery either and it is resolved by exposition at the end of the book and not really through the main action of the book. Still, I would wholeheartedly recommend Harlan Coben’s books to anyone, especially people who are new to his work, they have a real treat in store. I wish I could discover him for the first time again. Thanks to NetGalley and Bloomsbury for the ARC of this book. This is going to be a very brief review because I really don’t want to spoil this book for anyone who might want to read it and pretty much anything I say about this book will be a spoiler. I will just say that this is an incredibly complicated, intricately plotted and astonishingly detailed novel. I found it really difficult to get into because it throws you right into the action with an amnesiac unreliable narrator and it takes a while to get to grips with what is going on; but I’m glad I persisted because it is a thoroughly rewarding and unique read. I was not entirely satisfied with the ending but the journey was very interesting. 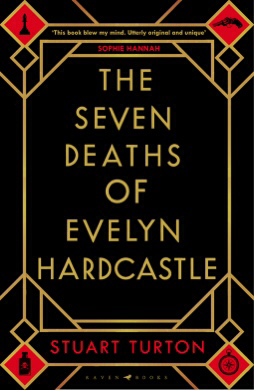 I think the title is a bit misleading, I was expecting the book to be about a woman called Evelyn; however, she’s a fairly secondary character. Instead, it is told from a very buttoned-up traditional male perspective, which I found a bit off-putting to start off with. I’d definitely recommend this book to fans of golden age crime looking for thoroughly modern and mind-bending interpretation of the traditional 1920s crime novel.